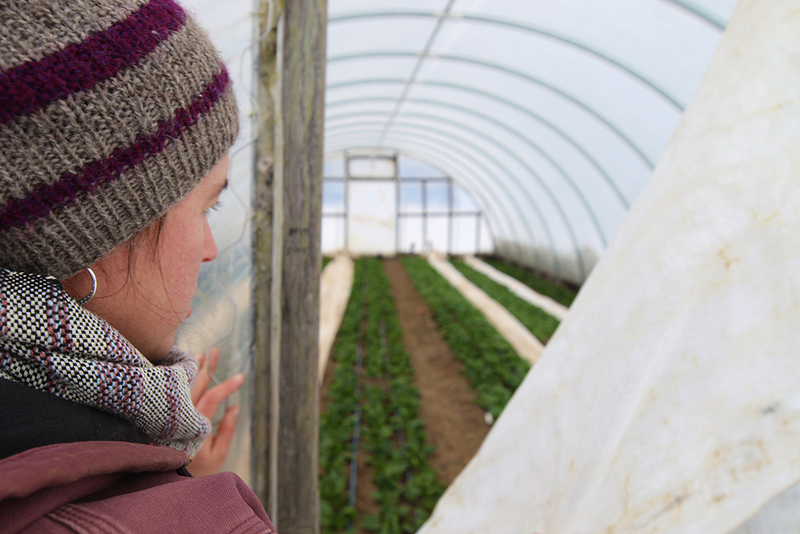 Genesis McKiernan-Allen peeks into one of the farm’s hoop houses. 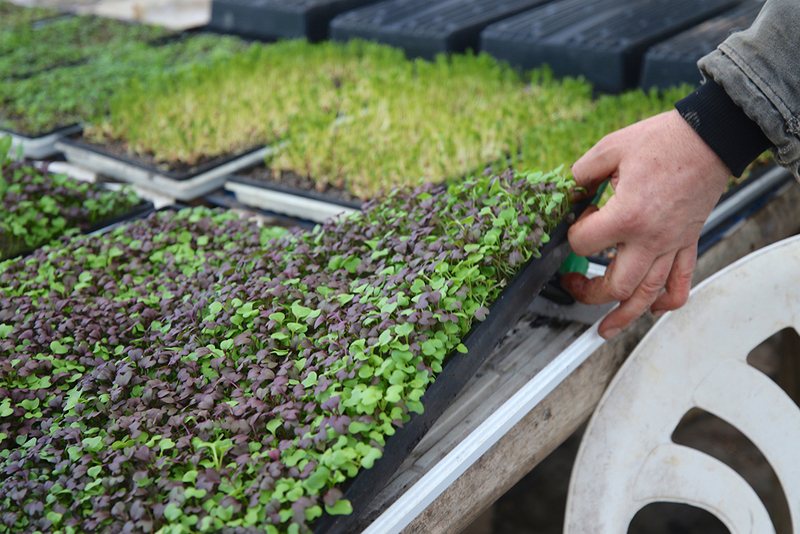 Full Hand Farm also specializes in microgreens in the winter. In unincorporated Noblesville, in its far northeast reaches, sits Full Hand Farm. The average person driving by wouldn’t have a clue of its existence because the farm is far back off the road. But once you’ve driven down the curving driveway up to a small home, the farm’s main green house can be seen adjacent, with rows of hoop houses even further back. Stepping into the hoop houses is like entering a different season, with floors covered in green, from an assortment of leafy greens to a variety of root vegetables. 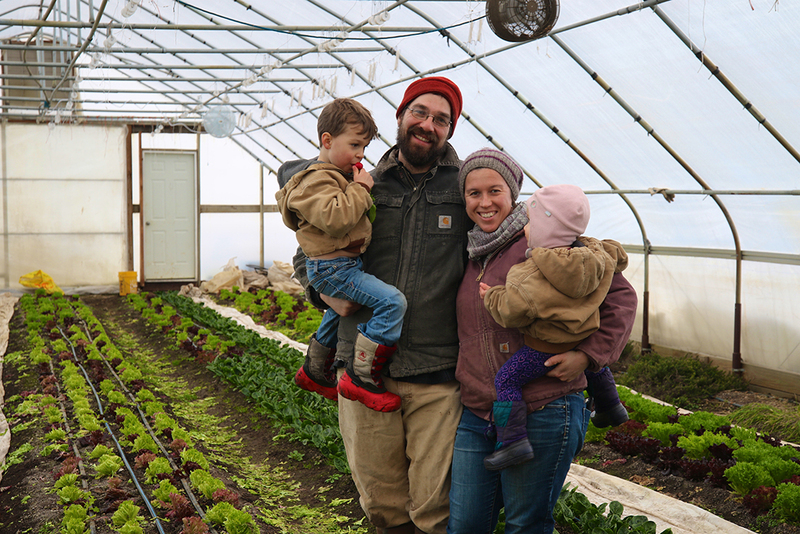 Husband and wife Eli Robb and Genesis McKiernan-Allen are the owners, having taken root on the 25-acre property – a former horse farm they bought on Craigslist – five years ago to start their own local, organic farm. Now, they have a son, Ezra, 4, and a daughter, Flora, who will be 2 in May. 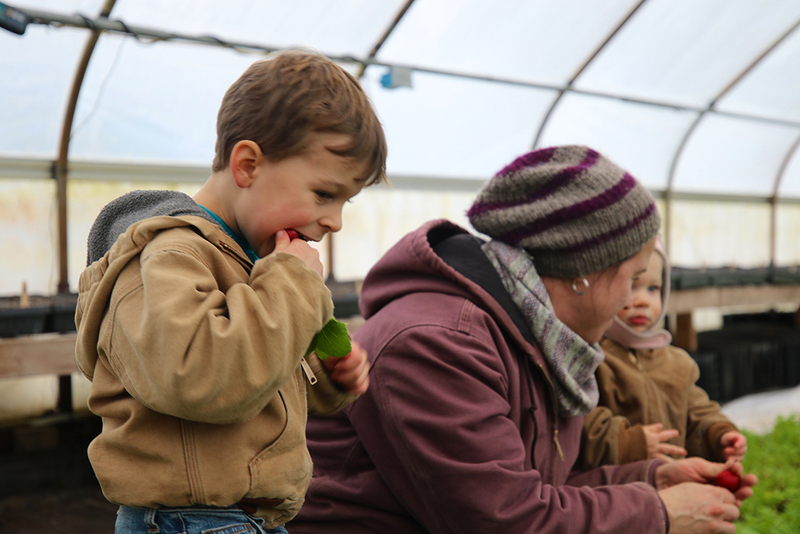 Considered a four-season farm, the family produces food year-round, farming approximately 5 acres outdoors. This year, they’ll farm an additional 3 acres at a nearby farm. During winter months, they move production to their greenhouse and 10 hoop houses, a round-topped structure that protects rows of plantings from harsh weather using large hoop-like supports that are covered in heavy plastic sheeting. In the dead of winter, the couple is already working on production for its busy season, preparing the start of peas, beets, kale and vegetables. Planning begins about two years out for each season. “A basic tenant of organic farming is crop rotation, so we’re not fertilizing with anything besides using cover crop, and we rotate, so we’re not pulling the same nutrients from the same piece of ground,” McKiernan-Allen said. Because they had no background in farming, Robb and McKiernan-Allen completed a two-year apprenticeship at a community-supported farm in Iowa. McKiernan-Allen said food from the farm is sold to local farmers markets and local restaurants. In the summer, Full Hand Farm is the exclusive vendor to the Broad Ripple Farmers Market, which operates year-round. In the winter, it is a vendor at the Indy Winter Farmers Market. Because the couple doesn’t sell products at grocery stores, and because the farm isn’t set up for people to stop by and shop, those looking to buy have to do so at farmers markets. Or, customers can purchase items from a fresh-produce case at Wheeler’s Cafe, just across from the farm. The café is attached to Mercantile 37, 25625 Ind. 37, a store of local and vintage home décor that opened in September 2018. Wheeler’s Café is a small restaurant and coffee shop. “We stock items over there a couple of times a week, and it’s been really fun to have that as an outlet,” McKiernan-Allen said. In addition to Wheeler’s Café, Full Hand Farm sells to approximately 25 other restaurants in the Indianapolis area, including nearly every Café Patachou, Petite Chou, Public Greens, Napolese, Bluebeard, Milktooth, Wildwood, The Meridian Restaurant, Late Harvest Kitchen and North End Barbecue, among others.